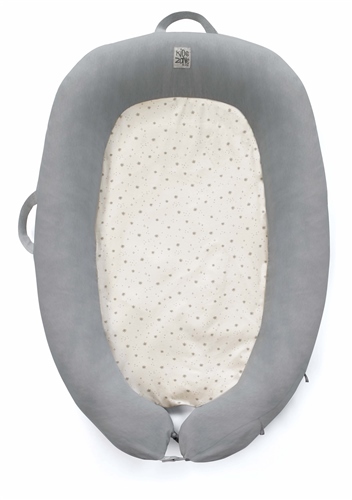 Reduction cushion - Encourages safe co-sleeping, allowing for possible use within the parents’ bed. Help your new baby get the rest they need with the Jané Growing Baby Nest. Gorgeously soft and comfy, it can be used anywhere around the house or when away from home, helping to achieve a sense of familiarity for your baby. Provides a safe place for your baby to feel snug, aiding longer and more restful sleep. The Nest is fully breathable and the soft 100% cotton cover can be easily removed and washed at 40ºC. The perfect accessory for your newborn. Encourages safe co-sleeping, allowing for possible use within the parents’ bed. Adaptable to baby’s growth thanks to the 3 position growing fixation system at the baby’s feet. Removable washable soft cover at 40ºC. Ideal for home or away as it's light and easy to transport thanks to the two handles. Can be used as a cot or junior bed insert. Reduces the risk of sudden death and favours sleep. Avoids flat head syndrome (plagiocephaly), loss of heat and sensation of vulnerability. Packaging doubles up as a carry bag.